Kevin Kinell, developer of Yipe! 5- Attack of Idle Hands, is a freaking genius. For those of you unwilling to bear the grinding that comes with an old school RPG game, stop reading right now. I’m serious. Stop reading and look into Gamevil’s Zenonia or Square Enix’s FF for the iPhone. You won’t appreciate the beauty that is Yipe! 5. For the rest of you, read on. 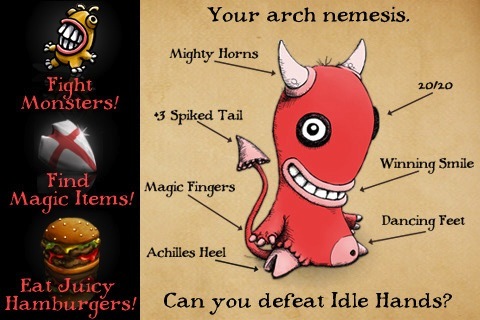 The aim of the game is to assist a king of a peaceful town called Yipe in bringing down oddball monsters unleashed by a mischievous creature by the name of Idle Hands. You’ll customize your character icon (choose from ninja, grim reaper, elf, knight, and what I like to call “hotdog superhero”). Then select your character type: sneaky (quick), superhero (strong), or brains (magical), each of which comes with its corresponding advantages. You’ll explore surface lands and underground caves (a la Rogue) while completing 6 different quests for your beloved king. The quests include: Zombie Madness, Spiders, Deadly Plants, Puff’s Backpack, Magic Mushrooms, and Stop Idle Hands. Defeat monsters along the way to gain experience points, magical items, and gold. Collect gold and find hidden gold chests to purchase food items (to restore HP), potions, armor, and weapons. Try and unlock the 8 secrets scattered throughout the game and find the 109 hidden chests. Overall Yipe! 5 offers a satisfying gameplay experience. Controls are what you’d expect for an RPG: they’re responsive and intuitive. You’ll move your character using the point-and-tap method. Or if you’re nitpicky about having smudges on your iPhone/iPod Touch like I am, use the directional arrows in the control box. In the same box, you can decide to show or hide your stats bar; switch the side the control box appears (Kinell respects righties and lefties alike); view more detailed stats; perform a “search” feature to view information on items or areas in the game; and look over the items in your bag. On your quests, don’t expect to see fancy-schmancy, detailed graphics or animations or prepare to be disappointed. You won’t see yourself entering doorways or be able to view the different movements monsters make when they attack. This is a classically styled RPG so characters and background drawings are less sharp and more cute/quirky. Thankfully, unlike classic RPGs, there’s a nifty autosave feature that saves your place if say…oh…your battery dies from continuous hours of play. Audio effects were also spot-on and intensify the gameplay experience. The different sound effects for different monsters, scenes/locations, and character movements were nice touches. Kinell also respects audiences by allowing them to control the soundtrack and sound effects through the control box. Kinell’s website for the game promises escape from the “drudgery” of everyday life, but many players will not appreciate the amount of drudgery they undergo before they seek any rewards. You’ll have to defeat many weaker monsters to afford food items (which restore HP) before you can buy enough to sustain yourself during fights with bosses. Expect lots of repetitive moves and monotonous play, but don’t let that deter you because the game is littered with witty remarks from monsters. It becomes highly addictive with the exploration for monsters, locations, gold, and secret items. Yipe! 5 may not be slick and shiny like newer RPGs, but it is sharp and just plain amusing. The developers are also continuously working on bugs and other fixes with their updates. I hope there will be additional levels, monsters, secrets, cheaper food items, and locations with future updates. Perhaps there could also be a secret level that unlocks after you defeat the monster? Yipe! 5 also has a FREE lite version which allows you to explore the first cave and advance through the first 8 levels of the game. Test it out and see if you can embrace the grinding that comes with the action. But $0.99 is a steal for the full version. AppSafari review of Yipe! 5 was written by Linda Ta on March 27th, 2010 and categorized under App Store, Featured, Fun, Games, RPG. Page viewed 4126 times, 1 so far today. Need help on using these apps? Please read the Help Page.